I always felt that Banjo-Kazooie, Banjo-Tooie and Donkey Kong 64 were three of the best games I ever played. The Grant Kirkhope soundtracks, the whimsical world and goofy characters, the dark sense of humour if you read between the lines, the sense of exploration – they all combined to create very charming video game experiences. The problem is that this style of game kind of disappeared after the Nintendo 64 era – but thankfully, Yooka-Laylee brought it back. The story goes that a lizard named Yooka and a bat named Laylee find the magical ‘One Book’, which is then stolen by an evil corporation who plan to use it for their own selfish gains. Unfortunately, all the pages end up breaking out and getting lost across several “Grand Tome” worlds, where the two of them have to try to hunt them down. The worlds are: some ancient ruins, a winter wonderland, a spooky swamp, a casino and a space pirate world. I adore these locations, because they’re all so beautifully rendered and have superb soundtracks to accompany them. These days, I find it hard to play games for more than a couple of hours, but I was easily able to do so when playing this game. I just loved getting lost in these enchanting locations: using logs as stepping stones in a murky marsh, making my way through icy caves or riding a minecart through a giant casino – my heart and imagination were captured in ways they hadn’t been in a long time. For fans of old Rare games, there are plenty of treats too. Kartos (an anthropomorphic minecart) appears in every level for some Donkey Kong Country minecart level tributes (though, I must say, they don’t quite play as well a the originals, but we still get some nice new David Wise music), a scientist named Dr. Puzz will use a special ray to transform you in every level, ala Mumbo Jumbo (with transformations including a galleon and a snow plow) and Roysten the Goldfish even makes a cameo swimming around in the bowl on her head. You’ll also find references to Conker the Squirrel and Jet Force Gemini. Also, he may not be Rare, but Shovel Knight appears as an NPC too. It’s a pity that there have been a moderately sized number of negative reviews of Yooka-Laylee, as I consider it one of the best games I’ve played in a while. Some say that the controls and camera are bad and effect enjoyment: I had no issues with either of these. Some say the worlds are barren and empty: they all felt appropriately populated to me. It may be a bit of a marmite experience, or perhaps I am a little skewed by nostalgia, but please don’t let these reviews put you off as there are many people, like me, who think its superb. So, I definitely recommend it. Not only is it a beautiful, enjoyable, immersive and addictive experience, but it’s also pretty hilarious – look out for Laylee’s snide comments to every person she meets! 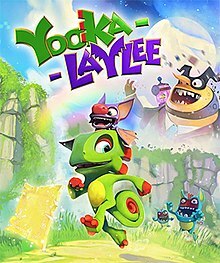 It’s a wonderful tribute to those classic N64 games and though it may not be quite good enough to surpass them, it’s still a good game in its own right and I certainly can’t wait to see what is done with Yooka and Laylee next.